Signature : Hokke Saburo Nobufusa. This Nobufusa　belongs to Jo saku ranging. Blade length : 64.8 cm or 25.51 inches. Sori : 0.4 cm or 0.16 inches. Width at the hamachi : 3.10 cm or 1.22 inches. Shape : It is wide and thick strong katna with long kissaki. Jitetsu : Koitame hadawell grained with flow of Masame hamon. JInie is attached and Chikei works could be viewed. Hamon : Nie Deki Suguha Hamon with mixture of calme Notare mixed. Gunoem midare with Choji midare mixed as well. Special feature : Hokke Saburo Nobufusa the 7th, born 1885 learned under Ichiryusai Sadatoshi and went under the name of Ryoun. He forged Bizen-Den sword mainly in prewar days and during the war with pupils. sharpness and endurance based on the report from the front. 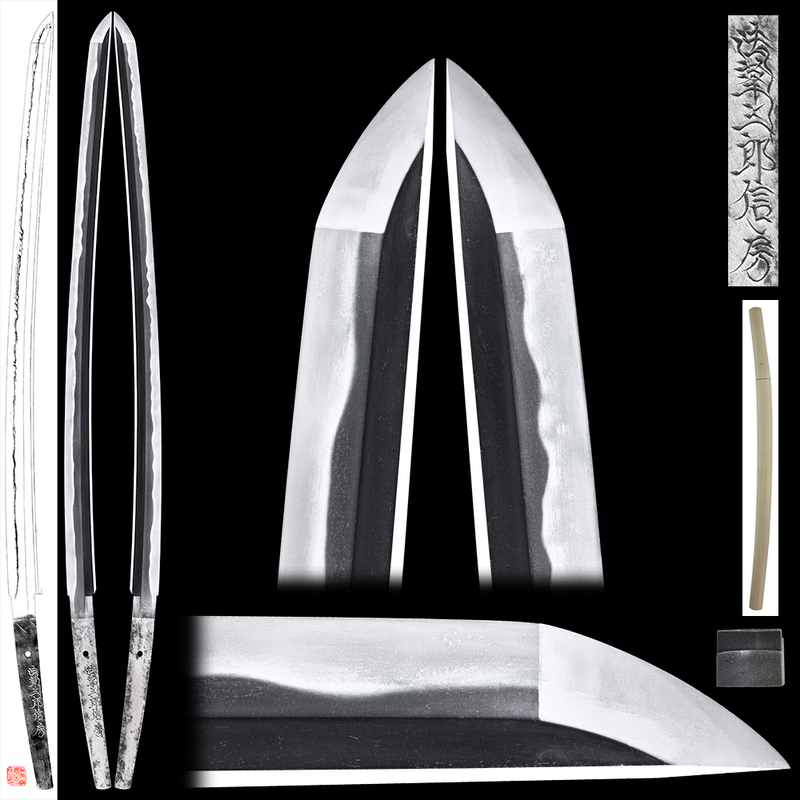 In the postwar Japan, he won prizes three times in the annual sword-making competition started in1955. Nobufusa’s son and grandson succeeded to the sword smith name. 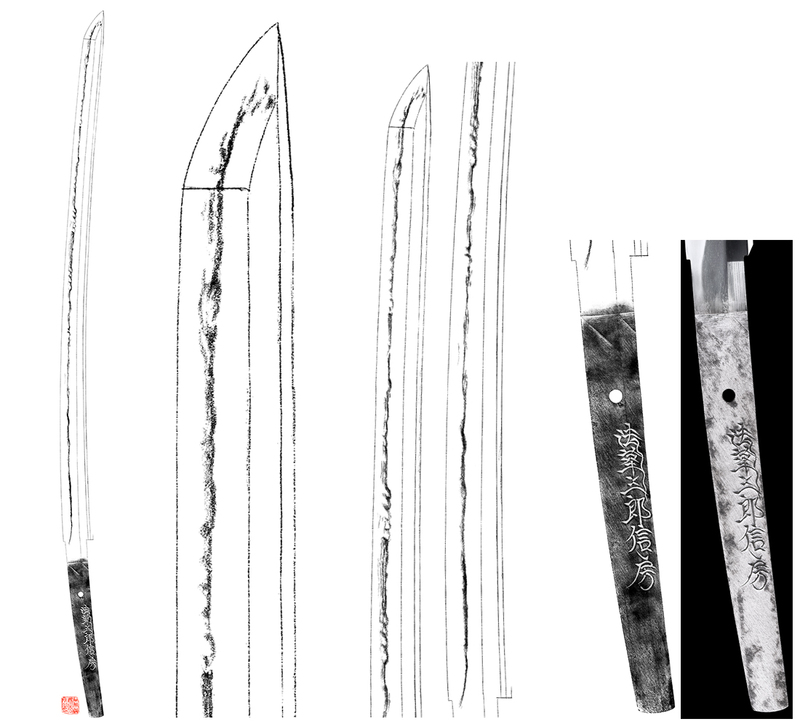 The present Nobufusa also participates actively making highly-motivated swords. He is good at forging traditional Masame-Hada of Yamato School called Hosho-Utsushi. The Nobufusas are highly admired. Katana : Mumei(unsigned) attributed as Sue Tegai school.